TranslateMedia has released The Language Cartridge, an innovative solution allowing ecommerce retailers to manage their international multi-language websites. 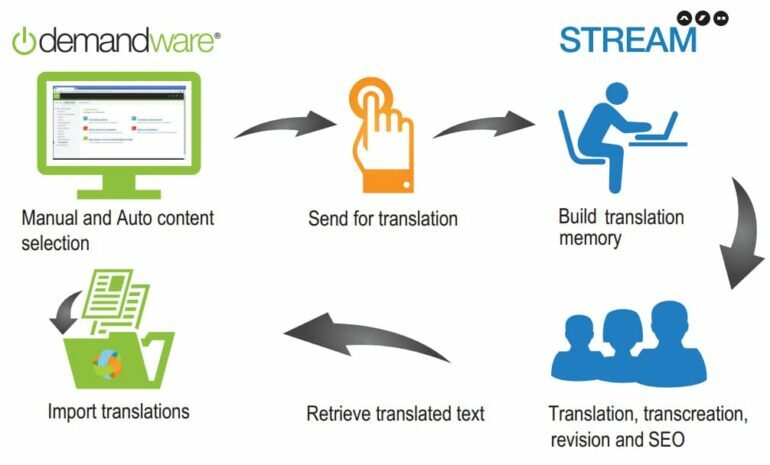 The technology enables seamless integration with Demandware and STREAM, TranslateMedia’s translation management system. The technology can be integrated in minutes and extends the Demandware Business Manager with its own translation interface. It provides a fast, secure system to manage multiple sites across different markets and languages. The Language Cartridge is available to download now on the Demandware LINK Marketplace. Below are some of the benefits of using The Language Cartridge for Demandware. The Language Cartridge provides a solution that enables Demandware clients to select products and other digital assets and deliver them for translation directly from within the Demandware Business Manager. The diagram below shows how Demandware and STREAM interact in more detail. The video below shows The Language Cartridge in action. Contact us to talk about your Demandware translation integration by using the form below or download the brochure. Demandware provides a different model for delivering ecommerce solutions to retailers. Traditionally, retailers would need to invest in the hardware and software to power their ecommerce stores and then hire developers to maintain the platforms and add the functionality that the business requires in order to remain competitive. Demandware removes the need for businesses to spend time and money on hardware, software and developers by offering a highly-scalable cloud-based ecommerce platform. This allows businesses to concentrate on growing their businesses. This innovative approach has allowed Demandware to become a market leader in SaaS ecommerce solutions. Now it makes even more sense for small and large ecommerce retailers to use Demandware for their multi-lingual international online stores. The Language Cartridge provides an end-to-end solution that allows businesses to integrate the translation management process straight into Demandware. The seamless integration with Demandware’s Business Manager allows marketing and ecommerce managers to select the content they would like translated, obtain a quote, track progress of their translation work and have the completed translations returned straight into their ecommerce store. Demandware is a public eCommerce merchant headquartered in Boston, Massachusetts. The organisation was founded in 2004 and has since expanded to offices in France and Germany. Demandware has expertise in delivering web content management and ecommerce solutions to organisations in the fashion, health and beauty and sporting goods sectors. Demandware powers more than 160 retailers across more than 600 websites around the globe including Adidas, Clarins, Fila, Lacoste, Lancome, Mothercare, Puma, Quicksilver, L’Oreal and Ugg, Australia. At TranslateMedia, we work with a number of clients in the fashion retail sector who use Demandware to power their ecommerce stores. We’re able to connect our translation management system to Demandware – allowing clients using the SaaS ecommerce platform to receive quotes, send work for translation then preview and edit any translated content before it is published on their websites. This streamlined workflow improves efficiency while ensuring that only the content that requires translation is submitted. Furthermore, we can offer clients additional cost benefits by using translation memory to recall any previously translated content on their Demandware site – further reducing costs and increasing efficiency. TranslateMedia is a global translation agency with offices in London, New York, Paris, Munich, Hong Kong, Singapore and Austin, Texas. The company offers a 24-hour service, 7 days a week providing brands and agencies with all the support they need to launch and manage their international marketing campaigns and websites. TranslateMedia pioneered the technology that allows retailers, ecommerce businesses and tech start-ups to expand into new developed and emerging markets globally. The technology, a proprietary workflow management platform, was developed in 2005 to help UK businesses manage their expansion programmes across multiple languages and territories.